This paper aims to link two fields of research which have come to form separate lines of inquiry: the sociology of moralisation and studies on class identity. Expanding on recent papers by Young (2009, 2011) and others, the paper argues that the concepts of ressentiment and respectability can be used to connect moralisation processes and the formation of class identities. This is explored through a case study of the social reaction in Britain to white working-class youths labelled 'chavs'. It is demonstrated that chavs are constructed through moralising discourses and practices, which have some elements of a moral panic. Moreover, moralisation is performative in constructing class identities: chavs have been cast as a 'non-respectable' white working-class 'folk devil' against whom 'respectable' middle-class and working-class people distinguish and identify themselves as morally righteous. Moralising social reactions are here to an important extent triggered by feelings of ressentiment. This is a dialectical process where respectability and ressentiment are tied, not only to the social control of certain non-respectable working-class others, but also to the moral self-governance of the moralisers. 1.1 The sociology of moralisation and studies on class identity are two research strands that have developed in highly promising directions in recent years. The sociology of moralisation has seen a productive dialogue between studies on moral panic and moral regulation, where both concepts have been conceptualised as forms of moralisation that entail the formation of moralising discourses which act upon the conduct of self and other (cf. Critcher 2009; Hier 2008, 2011). Similarly, in research on class identity the emergence of a 'cultural' class analysis influenced by Bourdieu has led to a renewed interest in the moral, affective and symbolic dimensions of class (cf.Sayer 2005; Skeggs 1997, 2004). But despite a mutual interest in processes such as moral boundaries and symbolic power, there has been a surprising lack of dialogue between these two strands of research. 1.2 To rectify this lack of dialogue this paper discusses how moralisation processes are related to the formation of class identities. Developing on recent work by Young (2009, 2011) and others I suggest that the concepts of ressentiment and respectability can be used to connect moralisation and class identity. This is explored through a case study of the social reaction to 'chavs'. In Britain the term has become widely used to denigrate white working-class youths appropriating a particular way of styling their appearance. I demonstrate that the figure of the chav has been constructed through moralising discourses and practices, which have elements of a moral panic. Moralisation is performative in that it serves to construct chavs as a 'non-respectable' white working-class 'folk devil' against whom 'respectable' middle-class and working-class identities are constructed. Moreover, moralisation is also bound up with ressentiment, a complex type of resentment. This is a dialectical process where notions of ressentiment and respectability are not only tied to the social control of those moralised, but importantly also to the moral self-governance of the moralisers. 2.1 In this section I will discuss recent developments in the sociology of moralisation. Within this research strand, moral panic and moral regulation have traditionally been conceptualised as mutually exclusive processes. As a consequence, researchers have usually advocated the use of one concept over the other when analysing moralisation processes. Following Cohen's (2002 ) classic work, a moral panic is usually conceived as a sudden social reaction over the behaviour of a person, group or category of people that are seen to threaten deeply-held values or 'moral order' in society and consequently are cast as 'folk devils'. 2.2 However, there is a tendency that moral panics are treated as short-lived, local events that lack a clear connection with more long-term and wide-ranging social processes (Hier 2011). To this end moral panics have been (re)conceptualised as strong and volatile social reactions rooted in long-term processes of moral regulation (Critcher 2009, 2014; Hier 2002, 2008, 2011; Hier et al. 2011; Hunt 2011; Yeomans 2009). Hunt argues that 'moral regulation projects are an interesting and significant form of politics in which some people act to problematize the conduct, values or culture of others and seek to impose regulation on them' (Hunt 1999, p.1). Moral regulation discourses emphasise the 'character reformation' of those who are regulated in accordance with the values of the regulators (Valverde 1994). Drawing on Foucault's work on governmentality and ethical self-formation, Hunt's (1999) point however is that projects of moral regulation involve as much the regulation of one's own activities as those of potentially harmful others. They therefore constitute 'an intimate link between the "governance of others", and the "governance of the self"' (Hunt 1999, p.2). 2.3 Bringing together moral panic and moral regulation under one framework of moralisation, Hier argues that 'Moral panic culminates at that point where moral regulation is perceived to be in a state of failure or dislocation, giving rise to a more immediate or explicit manifestation of regulatory intervention' (Hier 2002, 329). Moral panic discourses are typically focused on policing the immoral and dangerous behaviours of the 'folk devils', rather than the moral governance of self and other. In this sense, certain issues, child sexual abuse and violent crime for example, are more likely to erupt into moral panics than other issues, such as smoking or obesity, which are more prone to be objects of moral governance (Critcher 2009). 2.4 While these development within the sociology of moralisation have proved highly productive, unlike much classic research in this field (cf. Cohen 2002 ; Hall et al., 2013 ; Pearson 1983), recent studies lack any deeper theoretical engagement with social class. One of the few exceptions is Young (2009, 2011; see also Warner 2013) who deploys Ranulf's conception of moral indignation to argue that moral panics are rooted in class politics. Drawing on recent research in class theory I will now develop Young's argument and link it to the formation of class identities and the notion of respectability. 3.1 Moral indignation is 'a kind of resentment caused by the repression of instincts' (Ranulf 1964 , p.198) and bound up with feelings of envy. The concept is rooted in the more fully developed concept of ressentiment. Developed by Nietzsche (2003 ), sociological usages of the concept (e.g. Merton 1957; Meltzer and Musolf 2002; Ware 2008) can be traced to Scheler (1961 ). A 'chronic' form of resentment (Meltzer and Musolf 2002), ressentiment involves an actor's sense of unjust and undeserved deprivation or injury, which is attributed to the actions of another actor who is perceived to gain from this deprivation or injury. 'The emotions and affects primarily concerned', Scheler writes, 'are revenge, hatred, malice, envy, the impulse to detract, and spite' (Scheler 1961 ), p.4). The actor also experiences a sense of impotence because she feels powerless to retaliate against her wrongdoer. As a consequence, she has to repress her feelings of injury and instead display restraint and self-control. Lastly, ressentiment involves an element of 'sour grapes', namely, that 'one condemns what one secretly craves' (Merton 1957, p.155-6). 3.2 Scheler (1961 ) and Ranulf (1964 ) explicitly link the existence of ressentiment or moral indignation to the class structure of stratified societies in which a certain level of mobility exists. In particular, they locate this sentiment in the lower-middle class as they 'live under conditions forcing them to an extraordinarily high degree of self-restraint and subject them to much frustration of natural desires' (Ranulf 1964 , p.198). Young draws on this analysis to argue that for the middle-class, 'The discipline necessary to maintain their class position has with it a consequent fear of falling. The presence of the undisciplined and the hedonistic stoke the fires of righteous indignation' (Young 2011, p.250). The behaviour of these immoral others act as 'trigger points for the crystallisation of feelings of unfairness and despair' (Young 2009, p.12), unleashing a moral panic. Thus, the strains experienced among sections of the middle-class may lead to feelings of moral indignation or ressentiment, which are expressed in the form of a moralising social reaction directed against an immoral (working-class) other. 3.3 Expanding on Young's analysis I will link middle-class ressentiment and moralisation to claims on respectability by drawing on recent research on class identity. Respectability entails that subordinate groups display deference to the values of dominant groups (Sayer 2005; Skeggs 1997). Class distinctions based on respectability can be traced to Victorian society (cf. Pearson 1983) and are still central in Britain, where sections of the working-class have been denigrated as non-respectable, not only by the middle-class (Casey 2013;Lawler 2005; Skeggs 1997, 2004) but also by other working-class people (Watt 2006; Rogaly and Taylor 2009). 3.4 Recent years have seen a strong interest in research on the moral dimensions of class. Many studies have been influenced by Bourdieu (1984 ) and focus on how class formation inheres from the unequal distribution of capital forms and classificatory struggles over value and recognition (Lawler 2005, 2014; Savage 2000; Sayer 2005; Skeggs 2004). For Skeggs (1997, 2004, 2009), the construction of classed selves entails that certain value standards, such as those pertaining to respectability, become institutionalised and 'inscribed' upon bodies. Similarly, Tyler (2008, 2013a, 2013b; Tyler and Bennett 2010) argues that the classificatory struggles of class under neoliberalism result in the construction of 'abject figures' such as 'the chav' and 'the underclass' that become objects of moral governance and othering, one case being in the wake of the England riots in August 2011 (Tyler 2013b). In a related paper on the riots, Jensen (2013) also makes a rare reference to moral panics. 3.5 But while this important body of work addresses how class identities are constructed through moral governance it lacks a clear conceptualisation of how long-term moralisation processes are tied to volatile social reactions like moral panics. This is due to the lack of dialogue between this research strand and the sociology of moralisation. Connecting insights from both strands of research, my contention is that moralisation processes, as modes of class politics, involve classificatory struggles for moral hegemony (Hunt 2011), in which the middle-class strives to make the norms and values pertaining to respectability achieve hegemonic status. Forms of moralisation, and particularly the hostile societal reactions of moral panics, emerge when the hegemonic position of such respectable norms and values are under threat (Hunt 2011; Hier 2011; Young 2009). Moral panics are usually unleashed during times of socio-cultural change and uncertainty, where the folk devils become scapegoats for social problems and objects onto whom the moralisers can project their fears and anxieties (Young 2009). 3.6 Moreover, as Skeggs shows, moralisation processes are performative in constructing class identities along lines of respectability. Performativity serves to 'bring the perspective of the classifier into effect in two ways: first, to confirm the perspective of the classifier and, second, to capture the classified within discourse' (Skeggs 2004, 18). The performativity of moralisation involves classifying people and practices according to a respectable/non-respectable binary. It also entails the social control or moral governance of certain non-respectable working-class others as well as the self-governance of the moralisers themselves. But the strains and frustrations associated with practicing moral self-governance may lead to feelings of ressentiment directed against those working-class others perceived to disregard norms of respectable behaviour. In what follows I will further discuss the relationship between moralisation processes and the formation of class identities by exploring the social reaction to chavs. But first I will present the research methodology of the study. 4.1 The following discussion of the public discourse on chavs primarily draws on extensive analysis of newspaper articles. Media discourses are highly influential in framing and dispersing meanings about a public issue and can therefore provide an indication about how powerful and widespread it is among people in their everyday lives (Kitzinger 2004; Warner 2013). Moreover, newspapers often seek to reflect the views of their readers, not the least due to commercial pressures (Baker et al. 2013; Richardson 2004). 4.2 I used the LexisNexis database to select articles mentioning the word chav during the period 2004-2009 and published in five daily UK newspapers with nation-wide distribution and their Sunday equivalents. The newspapers were sampled to reflect differences in format and political orientation: the Guardian and the Times are broadsheets, the Daily Mail a middle-market newspaper and the Sun and the Daily Mirror are tabloids. Of these, the Guardian and the Daily Mirror are left-leaning, the Daily Mail and the Times conservative and the Sun can be described as populist. 4.3 The political allegiance of newspapers is important, especially in Britain, because it affects how issues are framed. As Baker and colleagues (2013, p.3) put it: 'In the United Kingdom, national newspapers function as more than mere "mirrors" of reality. Instead, they have the role of constructing ideologically motivated versions of reality, which are aimed at persuading people that certain phenomena are good or bad'. Moreover, broadsheets and tabloids frame issues differently due to differences in style and tone. They also attract different audiences. In the UK, broadsheets have a majority of middle-class readers while tabloids are more popular among the working-class (Baker et al. 2013; Richardson 2004). 4.4 The LexisNexis database search generated in total 2819 newspaper articles. All articles were analysed with the assistance of the software programme Atlas.ti. In the initial phase of analysis tentative codes where constructed in those sections of the articles addressing the topic of chavs, hence I left large portions of text uncoded. Codes and emerging themes were identified inductively but iteratively in dialogue with analytical concepts and theory. In the second stage of analysis, 353 articles where the topic of chavs was especially central to the content were selected for a more detailed analysis, during which the coding list was modified and themes and concepts constructed in the initial coding phase further developed and interconnected. The inductive-iterative (O'Reilly 2005) way of proceeding means that the notions of moralisation, respectability and ressentiment where not deployed in the beginning of the project but emerged gradually as interpretive frameworks during the research process. 5.1 The chav has become a widely circulated stereotype typically constructed around young white British people dressed in streetwear clothing and jewellery. The emergence and diffusion of this stereotype in many ways follows that of a classic moral panic. The term chav suddenly started to appear on 'humorous' websites such as Chavscum, which was set up in December 2003, where it was bound up with strong forms of hostility, mockery and moral-aesthetic distinctions (le Grand 2013). The term diffused rapidly and by the beginning of 2004, chavs were all over the public realm. In 2004 it was also named the buzzword of the year (Dent 2004) and became a dictionary term together with the terms ned and ASBO (see below). 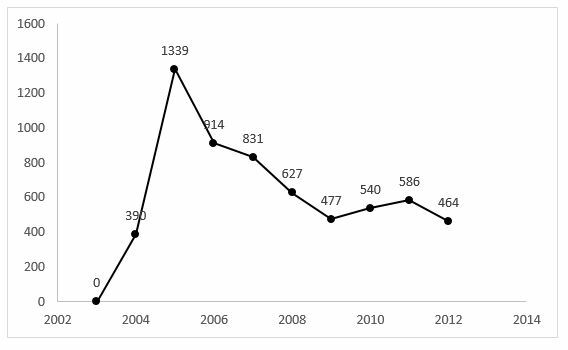 5.2 The sudden emergence of the term is shown in Figure 1, which depicts the total number of articles featuring the term chav in ten major national British newspapers during 2003-2012. While there are no mentions of the term in 2003, by 2004 it is mentioned in 390 articles. Numbers reach a peak in 2005, and with the exception of a slight rise in 2011, continue to decline each year. But despite this decrease in numbers, in 2012 'chav' was still mentioned in as many as 464 articles. The continuous use of the term indicates that it has become well institutionalised into British public discourse. Numerous studies also show how the chav figures as a highly derogatory term in individuals' everyday lives, particularly among young people (Archer 2012; le Grand 2010; Hollingworth and Williams 2009; Nayak 2006; Rimmer 2010; Tyler 2011). 5.3 But like many other moralisation processes, the phenomenon over which the social reaction emerged is not novel. Indeed, derogatory labels for working-class youths in streetwear have existed all over Britain since at least the early 1990s (Hayward and Yar 2006). These labels have had a local or regional character, such as charver in Newcastle, scally in Liverpool, ned in Glasgow and yarco in East Anglia. Chav was a local term used in southern England, including Medway in Kent and the East End of London (le Grand 2010, p.40-41). However, as a result of the widespread circulation of the term in recent years, it has become an umbrella term used to stereotype white young streetwear-clad working-class people all over Britain. 5.4 But why did such a hostile, nationwide social reaction to chavs emerge in the early 21st century? The current demonisation of chavs can be linked to an historical context of neoliberal economic restructuring and deindustrialisation leading to the rise of 'flexible' and poor work (McDowell 2003). This led to the increasing marginalisation, poverty and fragmentation of white working-class communities, particularly in the north of England (cf. Charlesworth 2000; Turner 2008). Moreover, their marginalisation became largely portrayed as due to individual moral failings or a culture of poverty, rather than structural conditions (Jones 2011). As Haylett (2001) has shown, by the late 1990s the political rhetoric of the New Labour government envisioning a multicultural, modern Britain simultaneously cast white poor working-class people as an unmodern, racist and backward 'other'. In Britain such public 'decline narratives' of the white working-class as an obsolete and backward remnant of industrial society not willing or unable to adapt to contemporary times, have continued to be influential (Collins 2004; Lawler 2005, 2014). In this context, the chavs with their conspicuous style of appearance have been a particularly easy target for moralisation and scapegoating. This will be explored further in the next sections. 6.1 Characteristic of moralisation processes, and especially moral panics, is that the moralised are constructed as a threat to 'an established value system' (Garland 2008, p.11) or 'moral order' (Cohen 2002 ; Critcher 2009), and thus cast as folk devils. There are elements of this in the discourse on chavs. Their appearance and life styles are typically mocked for lacking in taste. For example, chavs are described in the Daily Mirror as 'dripping with fake bling [jewellery]' (Hammond 2005). But aesthetic denigrations are frequently connected with moral boundaries, so that bad taste reflects a lack of morals. Take, for instance, the following account: 'nothing says "filthy Chavette" [female chav] quite like a nice thick pair of big hoop gold earrings. Add points if a police dog could actually jump through them. The final bit of bling has to be the 9 carat ankle chain. If the chain spells something such as "tart", even better and don't forget a nice fake watch in diamante' (Daily Mail 2004). In addition to representations of 'slutty' and 'filthy' femininity, female chavs are associated with single teenage motherhood and dysfunctional family structures (see also Tyler 2008). Thus, the Daily Mail write: 'A chavette who has reached the age of 15 without at least two badly behaved children by different fathers is known as frigid.' (Wyatt 2004). They just want to leech off the sweat of the rest of us… These freeloaders are not too thick to realise they can get more by scrounging on the dole rather than working. They've sussed that even with a minimum wage they can lie in their pits until the afternoon and still pick up a nice wedge, especially if they keep pushing out their soon-to-be-feral offspring (Gaunt 2008). We must make a stand at school and work. A father lies seriously injured in hospital after chasing a gang of youths who threw a stone at his car and getting beaten up by them; his local police chief describes how the streets of suburban Manchester are in the grip of "feral" youths with "no parental control or respect for anybody". A funeral car full of mourners has missiles hurled at it in what Cheshire police call "the ultimate disrespect for human dignity". The semi-final of a boys' football tournament has to be abandoned when parents brawl on the touchline, severely cutting and bruising the club manager. All of these incidents happened last week, along with the story of Becky Smith, a 16-year-old Manchester schoolgirl who was attacked and beaten up by a gang of teenagers as she walked home from a friend's house at 7.15pm. The gang punched and stamped on her, leaving her unconscious: one of them videoed the attack on a mobile phone and sent the film to her brother. It all adds up to a picture of a society under siege from yobbish behaviour (Craig 2005). 6.4 The article then states that this lack of respect is 'not just a chav problem' but rather the case of yob culture having spread to all strata in Britain. Thus, the author concludes, those righteous citizens that remain therefore need to act before it's too late. Similarly, a Daily Mail article entitled 'Are the Middle Class to Blame for Yob Britain?' (Deane 2005) claims that middle-class values built on 'respectability and decency', which once formed 'the bedrock of our civilization' and were emulated by the working-classes, have been abandoned – not the least by the middle-class themselves – and replaced by a widespread 'lack of respect and morality'. Instead, Britain has become a place 'where feral children wander without restraint, where drug-taking and gun crime is rife, where family structures have broken down and authority has collapsed'. What both of these articles show is that chavs are portrayed, not only as immoral individuals who are a threat to respectable values, but also symptomatic of the wider breakdown of such values in British society. 6.5 Thus taken together, chavs are cast as a folk devil – a non-respectable, white, working-class 'other', who lack both economic and cultural capital. Thus, chavs threaten the moral order of respectable society through their sexual and reproductive activities, disregard for family values, willing joblessness, anti-social behaviour and vulgar taste. Moreover, chavs' marginal class position is tied to a 'dirty' and therefore racialised form of whiteness (cf. Webster 2008). The other is working-class welfare cheats, which includes a gendered stereotype, namely the single, unwed, young, working-class mother (Ajzenstadt 2009; Naylor 2001; Phoenix 1996). But unlike most fully fledged moral panics there have been no moral entrepreneurs mobilising campaigns against chavs. Rather, the social reaction has emerged from the grass-roots (Goode and Ben-Yehuda 2009 ) of the British public domain. 6.6 Moreover, reflecting the contested nature of contemporary forms of moralisation (McRobbie and Thornton 1995), some journalists and other commentators, especially from the left, have criticised 'chav-bashing' as a form of classism or class-racism. For instance, the Guardian has argued that the use of the 'C-word' reflects the emergence of a 'new snobbery' where the middle-class are 'mocking and demonising supposed white trash' (Harris 2006). Yet, while tabloids and right-leaning newspapers often denigrate chavs, they sometime critique such denigration. For instance, the term has in the Times been described as a 'despicable term of class-loathing' (Turner 2008) and in the Daily Mirror as 'just a new name for the same old stick that has long been used to beat the poor old proles' (Parsons 2004). Conversely, in a few instances the Guardian has been complicit in the derogatory language directed against chavs. Thus, one article notes that the term 'seems to mean, roughly, ignorant, inarticulate, drunken yobs. It's very snobbish, but it's also quite funny' (Hoggart 2004). This vocabulary of class contempt has been critiqued in a letter to the broadsheet: 'In my experience, adverse comments [of chavs] are made not only by the upper classes, but often by right-on professional people more likely to read the Guardian than the Telegraph or the Daily Mail'. The letter also remarked that 'an article on alcohol-induced aggression in [the supplement] Education Guardian' was illustrated 'with a picture of a young man wearing the chav uniform of white trainers and a checked cap. Yes, elitism is alive and well' (The Guardian 2006). In the next section I will discuss how the articulation of moralising discourses directed against chavs have elements of injury and ressentiment. This Government has done more to attack the traditional family and the role of motherhood than Chitty Bang Bang's child catcher. /…/ Instead they've made the creation of illegitimate babies a national pastime for chavs who don't work, don't intend to work and, because of our ridiculous benefit culture, have no need to work. Look how many dole scroungers are breeding like rabbits with no regard to how they are going to support their offspring. /…/ We keep paying the higher council tax and utility bills to fund this underclass as they breed the next generation of lowlifes. It's almost an offence to be respectable and responsible (Gaunt 2006). If they [i.e. chavs] weren't quite so repellent, we wouldn't need to make jokes about them, would we? /…/ The function of satire is not only to make us laugh, but also, with luck, to draw our attention to the things that are wrong with the world and help mock them into extinction. /…/ …if nothing else, vicious observational comedy of this sort does at least serve as a safety valve for those of us who look on these social phenomena, helpless and aghast, and wonder why in God's name no one is doing anything to stop them. /…/ We see young girls being given a financial incentive to turn into single mums; we see parents unwilling to discipline and schools afraid to teach; we see a Government hell-bent on expanding the State so that more people are reduced to the role of whining supplicants; we inhabit a society obsessed with human rights but apparently uninterested in personal responsibility. We laugh at the underclass for the same reason we laugh in wartime and after appalling disasters: because if we didn't we'd only cry (Delingpole 2006). 7.3 Defending the mockery of chavs against accusations of snobbery, the article not only expresses a sense of injustice and harm, but also powerlessness to stop the 'scourge' of chavs and the threat to respectable values in British society that they pose. Thus, the article can be interpreted to express feelings of moral superiority as well as resentment and impotence, i.e. elements of ressentiment (Scheler 1961 ). 7.4 The article states that while the immoral behaviour of chavs cannot be stopped the only way of expressing one's sentiments is symbolically through 'satire'. In place of any actual retaliation against chavs, mockery can here be read as an expression of an 'imaginary or symbolic revenge' (Meltzer and Musolf 2002, p.248). Thus, mockery becomes, according to the article, a 'safety valve' – a way of expressing and coping with the injustice, resentment and impotence felt over the behaviour of chavs. 7.5 Mockery generally plays an important role in the chav discourse. Humour is used as a device to create distance, so that the content of what is expressed appears harmless (Raisborough and Adams 2008). In the case of the chav discourse, it also serves to legitimise the use of a strongly derogatory vocabulary. Moreover, while the appearance of groups of hooded youths in public space may be a source of uneasiness or fear, by ridiculing and belittling them one is making them seem less threatening. Lastly, mockery can be linked to the 'pleasure' associated with ressentiment (Scheler 1961 , p.8). Here the sadistic enjoyment accompanying this sentiment may become an end in itself so that one no longer wants to rectify the conditions giving rise to it. As Scheler writes: 'improvements in the conditions criticised cause no satisfaction – they merely cause discontent, for they destroy the growing pleasure afforded by invective and negation' (Scheler 1961 , p.8). …I simply feel it is time the middle-classes stood up for themselves. We work hard to make a decent home and life for our families and we pay our taxes to contribute to our society and economy. Unfortunately, everybody else in our society seems to take from us whether it is incompetent bankers or the shell suited urchins who haunt our street corners. /…/ We make a positive contribution to our economy and watch it all be frittered away by people who simply can't be bothered ('bovvered'). So regardless of whether it is class warfare or not I make no apology for proclaiming myself to be middle-class and a genuine contributor to our society (Digitaltoast 2009). 7.7 After his response, the Sunday Times named McLean 'Our hero of the week' (Sunday Times 2009). However, six months later the travel company was criticised in its sister newspaper the Times for its 'shameless snobbery' (Bleach 2009). Like previous cases discussed in this paper, McLean positions himself and his customers as respectable, productive, hard-working, tax-paying, middle-class citizens who try to provide moral and social order in a society where those above ('incompetent bankers') and below (chavs) exploit the fruits of their hard labour and deprive them of what they are due. Again, McLean expresses a sense of resentment and unfair injury coupled with helplessness to change the situation. 7.8 The classed grievances of ressentiment discussed in this section are bound up with a sense of unfairness that one's tax money is used on benefits for chavs and other non-respectable groups. Fairness has become an important element in current discourses around merit and social policies in the UK (Hall and O'Shea 2013; Hoggett et al 2013; Ware 2008). Underpinned by popular feelings of ressentiment against the 'undeserving' poor, the recent Coalition government drew on notions of fairness to legitimise cuts in welfare spending (Hoggett et al 2013). Under neoliberalism fairness has increasingly been reformulated from a collective, inclusive idea concerned with equality to a neoliberal notion linked to individual effort (Hall and O'Shea 2013). 8.1 In the wake of moral panics, measures of social control are typically instated in order to 'protect' the public from the threat posed by the 'folk devils' (Cohen 2002 ). This was also the case of the anxieties and resentments that surrounded chavs who became the target of new and existing forms of policing. One is that chavs have been associated with Anti-Social Behaviour Orders (ASBOs). First issued in 1998, an ASBO is a civil order that aims 'to restrict the movement and behaviour of people deemed to be anti-social' (Millie 2008, p.379), but may be transformed into a criminal offence if breached. ASBOs are forms of moral governance that have come to target young people and their activities in urban space (Flint and Nixon 2006). The New Labour government's concern with anti-social behaviour have been founded on the belief that the latter is 'fundamentally caused by a lack of respect for other people' (Home Office 2003, p.7; quoted in Flint and Nixon 2006, p.939). In 2005 this led to the instatement of the (subsequently defunct) 'Reform and respect agenda'. 8.2 A widely reported case linking ASBOs with chavs was 19 year-old Kerry McLaughlin living in North Tyneside, who was called a 'Geordie ASBO chav' (Hyland 2005), 'Queen ASBO' and 'real life Vicky Pollard' (Armstrong 2005) in the Daily Mirror. After 111 complaints by neighbours and 25 visits by the police she was issued a particularly powerful form of ASBO banning her from entering her flat (Armstrong and Donnelly 2005). Similarly, in a 'humorous' Daily Mail article ASBO is described as 'a vital rite of passage for young Chavs' (Thomas 2004). In accounts such as these chavs are portrayed as glorifying anti-social behaviour. However, an article in the Observer has also critically noted that 'Asbos are just the word chav made concrete, a vehicle for old-school class hatred made over to look all pretty' (Callwalladr 2005). 8.3 Following this increasing governance of young people in urban space, one form of policing targeting chavs has dealt with the regulation of access to public space. Shopping malls, pubs, night clubs and internet cafes started banning the wearing of garments or brands associated with chavs, including baseball caps, 'hoodies' (hooded tops), tracksuits and clothes in Burberry check. One of the cases most covered by the media was the ban on hoodies in the Bluewater Shopping Centre in Kent (see Hier et al 2011). The ban, which was instated in 2005, was described in the Daily Mirror as a 'crackdown on chav-style clothing' (Williams 2005) and endorsed by both Prime Minister Tony Blair and Deputy Prime Minister John Prescott. Blair claimed that people were 'rightly fed up with street corner and shopping centre thugs' and that adults were failing in their parental responsibilities (Horne 2005). As we have seen, these are familiar themes in the moralisation of chavs. Since deviant behaviour can be associated with the wearing of baseball caps we are politely asking those people who enter our premises not to wear caps. This policy is designed to combat antisocial behaviour such as theft. Our cafes are equipped with CCTV cameras and it can be quite difficult to identify people if they are wearing baseball caps (Horne 2005). 8.5 Here we can see the role of surveillance in identifying and controlling allegedly deviant youths. Moreover, like in Bluewater, the ban was framed in the discourse on chavs by the media. Thus, the same Sunday Times article bluntly stated that 'baseball caps have become part of the uniform of so-called "chavs", working-class youths often associated with antisocial behaviour' (Horne 2005). In sum, the portrayal of chavs as a threat to the moral order has served to legitimise different forms of social control. 9.1 I have argued that the moralisation of chavs entails constructing them as a folk devil threatening the moral (and aesthetic) order of British society. These processes have some, although limited, elements of a moral panic, namely the sudden emergence of the social reaction, the alarmist vocabulary, the widespread circulation of hostility and disgust, the symptomatic character of moralisation and the instatement of different forms of social control. The moralisation of chavs has been contested, particularly by left-leaning commentators and broadsheets, as well as served to put issues of class on the public agenda (le Grand 2013). Moreover, contra classic moral panics, there has been no discrete group of moral entrepreneurs organising campaigns against chavs. Rather the social reaction emerged and diffused spontaneously throughout the 'grass-roots' of the public sphere. 9.2 I have also shown how the moralisation of chavs not only serves to project the moralisers' anxieties and resentments onto the chav folk devils, but is also performative of constructing class identities based on notions of respectability. The performativity of moralisation works dialectically, firstly by constructing chavs as belonging to a non-respectable fraction of the white British working-class. Secondly, it serves to strengthen the identities and moral values of the moralisers. This entails a form of moral self-governance as the moralisation of an immoral other simultaneously means that the moraliser must act according to norms of respectability. 9.3 But the strains associated with the self-control necessary for the moral self-governance involved in constructing and maintaining such a respectable identity, together with the presence of conspicuous and non-respectable 'chav' others, can lead to ressentiment. In this context, chavs have served as a 'trigger' for moralisation; they are associated with a range of behaviours deemed non-respectable, including loutishness, anti-social behaviour, violence, petty crime, worklessness, teenage pregnancy and vulgarity/excess. Combined with their noticeable style of appearance and the increasingly marginal position of the white working-class in neoliberal Britain, chavs have become a thankful target for a moralising social reaction. Unlike emotions that have a clearer cognitive and discursive content, more affective reactions such as those of ressentiment are vaguer and usually directed against shifting targets (Hoggett et al. 2013). This study shows how moralisation processes can serve to channel such sentiments onto a particular target which becomes stereotyped as a folk devil. Moreover, in the context of marginalised whiteness the moralising discourse directed against chavs has become a widely legitimate form of class contempt, which would be much more difficult to direct against any ethnic or sexual minority with the same force without receiving accusations of racism or sexism (le Grand 2013). 9.4 This is related to the 'hegemonic role' (Hunt 2011, p.62) of moralisation processes. Moralisation is linked to a form of class politics rooted in class-based classificatory struggles for prestige, value/worth and recognition. Chavs have been conceived as a threat to the authority and hegemony of respectable values and this has generated a moralising social reaction. In conclusion, the paper contributes to current research by linking moralisation and class identity formation and showing how both processes are rooted in the notions of class politics, respectability and ressentiment. I am grateful for the very helpful comments and suggestions provided by the three anonymous referees. The writing of this article has been supported by grants from the Helge Ax:son Johnson Foundation, Royal Swedish Academy of Science and Åke Wiberg Foundation. 1 The concept of moral regulation became widely known through Corrigan and Sayer's (1985) historical study of English state formation. However, contemporary scholars, such as Hunt (1999) and Valverde (1994), have focused more on the practices of non-state actors in governing morals. 2 Meltzer and Musolf (2002) argue that ressentiment can be distinguished from resentment on two grounds. Firstly, while feelings of resentment in everyday life maybe be fleeting and sudden, ressentiment entails a stable, long-term state of resentment. Secondly, a necessary element of ressentiment, but not of resentment, is a sense of impotence, which stems from the inability to retaliate against the agent of injury. 3 This is in contrast to Nietzsche (2003 ) who argues that ressentiment originates from the 'slave morality' emerging from Judeo-Christian ethics. 4 Some scholars within the sociology of moralisation have conceptualised these processes as forms of status politics where groups compete about the distribution of prestige in society (Garland 2008; Gusfield 1986 ). However, I would argue that such competition for status, rather than reducible to a Hobbesian quest for power, is fundamentally bound up with a struggle for value/worth and recognition (cf. Sayer 2005). 5 In the analysis, the Observer and the News of the World (now discontinued) have been included as the Sunday editions of the Guardian and the Sun respectively (cf. Baker et al. 2013). 6 Over the years, the Sun have supported both Margaret Thatcher's Conservative government and Tony Blair's New Labour government (BBC News 2009). 7 Important to this iterative process was also the writing of memos, i.e. 'analytical, conceptual or theoretical notes' (Thornberg and Charmaz 2013, p.163), which allowed me to formulate ideas and questions about themes and categories in the data or about theories, concepts or literature relevant to the study (Thornberg and Charmaz 2013). 8 In Scotland the term ned is used in a similar manner to chav. The two terms are sometimes used interchangeably. 9 Included are the ten most widely circulated national newspapers and their respective Sunday editions: the Daily Mail, the Daily Star, the Daily Telegraph, the Daily Express, the Financial Times, the Guardian, the Independent, the Daily Mirror, the Sun and the Times. 10 The etymology of the term chav is unclear, but it is commonly suggested that it stems from the Romani words 'chavi' and 'chavo', which mean 'male Romani child' and 'unmarried Romani male' respectively. Both words can be traced to the mid-19th century (Oxford English Dictionary 2006). 11 A particularly articulate and influential account has been the book Chav: The Demonization of the Working Class, by the writer and journalist Owen Jones (2011). 12 For a related case exploring the relationship between sadistic pleasure, disgust reactions, symbolic boundaries and social inequality, see Cross and Littler's (2010) analysis of Shadenfreude toward celebrity misfortune. 13 As forms of governance, ASBOs work in tandem with so-called Acceptable Behaviour Contracts (ABCs). An ABC is 'a written agreement between a person who has been involved in anti-social behaviour and one or more local agencies whose role it is to prevent such behaviour' (Home Office 2002, p.52; quoted in Flint and Nixon 2006, p.947). While ASBOs are instated to control individuals who have engaged in anti-social behaviour, ABCs aim to stop people from acting anti-socially in the future. 14 Vicky Pollard is a character in the BBC television comedy series Little Britain. Played by Matt Lucas, Vicky Pollard has got the characteristics of a stereotypical chavette: a woman in her late teens who is overweight, wears streetwear clothing, golden jewellery, lives on a council estate, goes on welfare, chain-smokes, shoplifts, has about a dozen babies, gets pregnant regularly, is fickle, aggressive and extremely foulmouthed. Kerry McLaughlin is only one of several cases where journalists have used Vicky Pollard as a reference point in order to illustrate and explain what a chav is (see le Grand 2010; Tyler 2008). ARMSTRONG, J (2005) 'Queen ASBO: Teenager Faces Eviction after 111 Complaints in 18 Months', Daily Mirror, 3 May. ARMSTRONG, J and Donnelly, C (2005) 'Yeah But No But They've Locked Me Up … Whatever', Daily Mirror, 9 May. BLEACH, J (2009) 'If Your Name's on the List, You're Not Welcome', The Times, 28 June. BBC NEWS (2009) 'The Politics of UK Newspapers', available at: http://news.bbc.co.uk/1/hi/uk_politics/8282189.stm (consulted on 3 December 2014). BOURDIEU, P (1984 ) Distinction: A Social Critique of the Judgement of Taste, Cambridge, Mass. : Harvard University Press. CADWALLADR, C (2005) 'Comment: Get an Asbo, Get Ahead', The Observer, 12 June. CASEY, E (2013) (2014) '"Mass Gambling" from 1947 to 2011: Controversies and Pathologies', Sociological Research Online, 19(3) http://www.socresonline.org.uk/19/3/13.html. CHARLESWORTH, S (2000) A Phenomenology of Working-Class Experience, Cambridge: Cambridge University Press. COHEN, S (2002 ) Folk Devils and Moral Panics: The Creation of the Mods and Rockers, London: Routledge. COLLINS, M (2004) The Likes of Us: A Biography of the White Working-Class, London: Granta. CORRIGAN, P and Sayer, D (1985) The Great Arch: English State Formation as Cultural Revolution, Oxford: Blackwell. CRAIG, A (2005) 'They Can't Stop the Yobs – So It's Down to You', The Times, 22 May. DAILY MAIL (2004) 'Welcome', Daily Mail, 25 September. DELINGPOLE, J (2006) 'A Conspiracy against Chavs? Count Me In', The Times, 13 April. DEANE, A (2005) 'Are the Middle Class to Blame for Yob Britain? ', Daily Mail, 4 June . DENT, S (2004) Larpers and Shroomers: The Language Report, Oxford: Oxford University Press. DIGITALTOAST (2008) 'Activities Abroad Offers Chav-Free Holidays', available at: < http://www.digitaltoast.co.uk/activities-abroad-chav-free-holidays > (consulted 3 May 2013). GAUNT, J (2006) 'Put Families before Scroungers', The Sun, 21 February. GAUNT, J (2008) 'Karen's in a Class of Her Own', The Sun, 18 April. GUSFIELD, JR (1986 ) Symbolic Crusade: Status Politics and the American Temperance Movement, Urbana: University of Illinois Press. HALL, S, Critcher, C, Jefferson, T, Clarke, J and Roberts, B (2013 ) Policing the Crisis: Mugging, the State, and Law and Order, Basingstoke: Palgrave Macmillan. HAMMOND, R (2005) 'Richard Hammond: Kappa Trackie', Daily Mirror, 4 February. HARRIS, J (2006) 'Bottom of the Class', The Guardian, 11 April. HOGGART, S (2004) 'Simon Hoggart's Diary: If Blair has a Fault, it is just that He Wants to Save Us', The Guardian, 2 October. HOME OFFICE (2002) A Guide to Anti-Social Behaviour Orders and Acceptable Contracts, London: Home Office. HOME OFFICE (2003) Respect and Responsibility: Taking a Stand against Anti-Social Behaviour, London: Home Office. HORNE, M (2005) 'Stelios Puts Ban on Baseball Caps', The Sunday Times, 18 December. HUNT, A (1999) Governing Morals: A Social History of Moral Regulation, Cambridge: Cambridge University Press. HUNT, A (2011) 'Fractious Rivals? Moral Panics and Moral Regulation', in Hier, SP (ed), Moral Panic and the Politics of Anxiety, London: Routledge. HYLAND, I (2005) 'Not One Flasher Inspiration Here', Daily Mirror, 5 June. JONES, O (2011) Chavs: The Demonization of the Working Class, London: Verso. KHAN, A (2006) 'Ned Test? You Must be Joking', News of the World, 1 October. KITZINGER, J (2004) Framing Abuse: Media Influence and Public Understanding of Sexual Violence Against Children, London: Pluto Press. LE GRAND, E (2010) Class, Place and Identity in a Satellite Town, Stockholm: Stockholm Studies in Sociology, New Series 48. LE GRAND, E (2013) 'The "Chav" as Folk Devil', in Critcher, C, Hughes, C, Petley, J & Rohloff, A (eds), Moral Panics in the Contemporary World, London: Bloomsbury. MCDOWELL, L (2003) Redundant Masculinities? Employment Change and White Working Class Youth, Oxford: Blackwell. MERTON, RK (1957) Social Theory and Social Structure, New York: Free Press. MILLIE, A (2008) 'Anti-Social Behaviour, Behavioural Expectations and Urban Aesthetic', British Journal of Criminology, 48(1), p. 379-394. NAYAK, A (2006) 'Displaced Masculinities: Chavs, Youth and Class in the Post-Industrial City', Sociology, 40(5), p. 813-831. O'REILLY, K (2005) Ethnographic Methods, London: Routledge. PARSONS, T (2004) 'A Wide Gap between Chavs and Chav-Nots', Daily Mirror, 25 October. PEARSON, G (1983) Hooligan: A History of Respectable Fears, Basingstoke: Macmillan. PHOENIX, A (1996) 'Social Constructions of Lone Motherhood', in Silva, EA (ed), Good Enough Mothering? Feminist Perspectives on Lone Mothering, London: Routledge. RANULF, S (1964 ) Moral Indignation and Middle-Class Psychology: A Sociological Study, New York: Schocken Books. RAISBOROUGH, J and Adams, M (2008) 'Mockery and Morality in Popular Cultural Representations of the White, Working Class', Sociological Research Online, 13(6) http://www.socresonline.org.uk/13/6/2.html. READE, B (2007) 'The Reality is that TV is in the Gutter', Daily Mirror, 25 January. RICHARDSON, J (2004) (Mis)Representing Islam. The Racism and Rhetoric of British Broadsheet Newspapers. Philadelphia: John Benjamins Publishing Company. RIMMER, M (2010) 'Listening to the Monkey: Class, Youth and the Formation of a Musical Habitus', Ethnography, 11(2), 255-283. ROGALY, B and Tyler, B (2009) Moving Histories of Class and Community, Basingstoke: Palgrave Macmillan. SAVAGE, M (2000) Class Analysis and Social Transformation, Buckingham: Open University Press. SAYER, A (2005) The Moral Significance of Class, Cambridge: Cambridge University Press. SCHELER, M (1961) Ressentiment, New York: Free Press of Glencoe. SKEGGS, B (1997) Formations of Class and Gender: Becoming Respectable, London: Sage. SKEGGS, B (2004) Class, Self, Culture, London: Routledge. SKEGGS, B (2009) 'The Moral Economy of Person Production: The Class Relations of Self-Performance on "Reality" Television', The Sociological Review, 57(4), p. 626-644. THE GUARDIAN (2006) 'Reply: Letters and Emails', The Guardian, 17 April. THE SUN (2004) 'Chav Jokes by Royal Appointment', The Sun, 16 October. THE SUNDAY TIMES (2009) 'Oh No – a Plane Full of Rods', The Sunday Times, 1 February. THOMAS, D (2004) 'A Very Merry', Daily Mail, 11 December. THORNBERG, R and Charmaz, K (2014) 'Grounded Theory and Theoretical Coding', in Flick, U (ed), The Sage Handbook of Qualitative Data Analysis, London: Sage. TURNER, J (2008) 'Two Nations Divided by a Lack of Opportunities', The Times, 9 June. TYLER, I (2008) '"Chav Mum Chav Scum"', Feminist Media Studies, 8(1), p. 17-34. TYLER, I (2013a) Revolting Subjects, London: Zed Books. TYLER, I (2013b) 'The Riots of the Underclass? Stigmatisation, Mediation and the Government of Poverty and Disadvantage in Neoliberal Britain', Sociological Research Online, 18(4) http://www.socresonline.org.uk/18/4/6.html. TYLER, I and Bennett, B (2010) '"Celebrity Chav": Fame, Femininity and Social Class', European Journal of Cultural Studies, 13(3), p.375-393. TYLER, K (2011) 'New Ethnicities and Old Classities: Respectability and Diaspora', Social Identities, 17(4), p. 523-542. VALVERDE, M (1994) 'Moral Capital', Canadian Journal of Law and Society, 9(1), p. 213-232. WARE, V (2008) 'Towards a Sociology of Resentment: A Debate on Class and Whiteness', Sociological Research Online, 13(5) http://www.socresonline.org.uk/13/5/9.html. WARNER, J (2013) 'Social Work, Class Politics and Risk in the Moral Panic over Baby P', Health, Risk and Society, 15(3), p. 217-233. WATT, P (2006) 'Respectability, Roughness and "Race": Neighbourhood Place Images and the Making of Working-Class Social Distinctions in London', International Journal of Urban and Regional Research, 30(4), p. 776-797. WEBSTER, C (2008) 'Marginalized White Ethnicity, Race and Crime', Theoretical Criminology, 12(3), p. 293-312. WILLIAMS, A (2005) 'Hoodlums Ban; Shopping Mall in Blitz on Chav Gear', Daily Mirror, 12 May. WYATT, P (2004) 'Absolutely Chavulous', Daily Mail, 31 October. YEOMANS, H (2009) 'Revisiting a Moral Panic: Ascetic Protestantism, Attitudes to Alcohol and the Implementation of the Licencing Act 2003', Sociological Research Online, 14(2) http://www.socresonline.org.uk/14/2/6.html. YOUNG, J (2009) 'Moral Panic: Its Origins in Resistance, Ressentiment and the Translation of Fantasy into Reality', British Journal of Criminology, 49(1), p. 4-16. YOUNG, J (2011) 'Moral Panics and the Transgressive Other', Crime, Media, Culture, 7(3), p. 245-258.